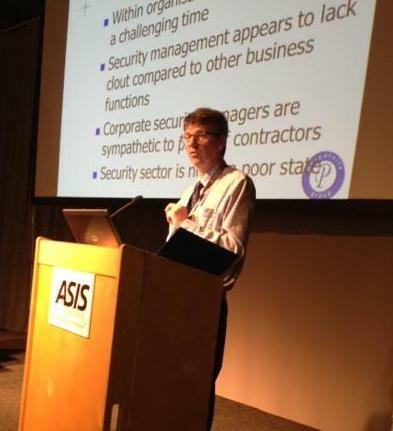 Earlier this month was the 12th ASIS International European Security Conference and Exhibition in Gothenburg Sweden. The conference provided a comprehensive education programme covering a range of topics from animal rights extremism, to cyber security, to the Syrian revolution. As well as presentations there were also panel discussions, case studies and networking events. Our director, Martin Gill, not only attended but also gave two talks at the conference. The first ‘Criminals and security professionals, who now has the upper hand?’ discussed why criminals succeed and was based on the latest research findings. Having spoken to offenders in prison Martin discussed the ways in which they are adapting to the latest challenges posed by security, including the skills sets they are using and why they feel they have the upper hand. The second talk was a panel discussion on ‘The relation between guarding costs and the strength of public/private sector relationships’ with Nicolas Le Saux (Owner, ATAO SAS). The conference was excellently attended as always and provided much food for thought.